Kisman (1953) pioneered with personal computers in the 80s in graphic design and animation. He managed and still manages to combine digital technology and his manual design and drawing skills into an accessible and attractive visual language. This resulted in very distinctive work in print, television graphics and web designs. In a respectable and reward winning career he has been working as designer for Paradiso Amsterdam and the Dutch Postal service, chief graphic design at VPRO Television, art director at Vinyl music magazine, Barcelonean Ruta 66 magazine and US-Dutch Language Technology/Electric Word, art director at San Francisco based Wired Television. He taught and lectured on graphics design, typography and animation at different institutes in the Netherlands, USA and Europe. Kisman currently runs his design studio from Amsterdam, the Netherlands. Beekman(1961), Mertens and Kisman share their passion for music, type design and art. As a musician Beekman has been involved in many bands, record production including sleeve design and promotional activities. With his design studio DBXL he has served many clients in the music business. He co-founded Typeradio, a MicroFM broadcast, MP3 internet radio stream and podcast station on typography and graphic design. 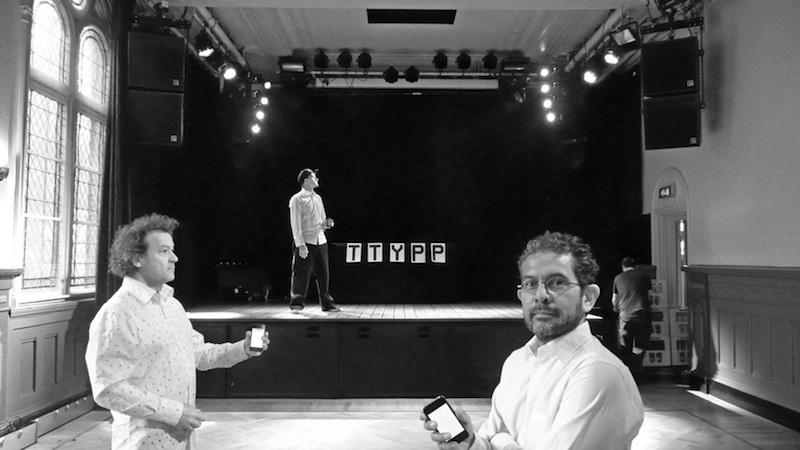 Since 2004 Typeradio is visiting different design events around the world, to meet designers and to talk. These shared interests culminated in their TTYPP iPhone Jam project, creating instant animation and music.